Troy Wilson grew up in Port Alberni and credits the John Howitt Elementary library among the things that helped him through his childhood. Despite growing up in a nature-lovers paradise, Wilson the boy, loved books and if not for the libraries and librarians of his youth he wouldn't be what his is today, a successful author. In his Canadian Society of Children's Authors, Illustrators and Performers bio he says his favourite activities as a child were reading writing and cartooning. "As long as I had a steady supply of food, books, comics, paper and pens I was as happy as a colt in clover," he writes. That's probably why he's become a successful author of books for kids and spearheaded a campaign to support school libraries. October 2008 is International School Library Month and in honour of that, Wilson has launched a year-long Be a Book Hero campaign. For every $20 donated, Wilson will send the donor a personalized copy of his picture book, Perfect Man, send a cartoon poster to the school of the donor's choice and give $7.50 to Love of Reading in Canada or Reader to Reader in the U.S. Both organizations support school libraries. 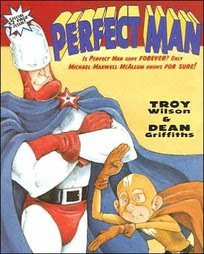 Perfect Man is about a boy whose favourite superhero retires, leaving him to discover his own super power, the ability to write really well, with the help of a wonderful teacher. Perfect Man has won a number of awards and his second book Frosty is a Stupid Name has also been published by Orca. Wilson now lives in Victoria. He attended school in Port Alberni until his last two high school years, when his family moved to Nanaimo. Throughout his teen years he wrote on and off then he started college planning to be a teacher, but didn't complete the degree. Wilson wandered the work-a-day world for awhile, working as a burger flipper, a private in the army, a gas jockey, a page at the Vancouver Island Regional Library, a daycare worker, a summer camp counsellor, an Internet skills trainer, a radio DJ and producer, a respite care worker and a market survey taker. In 2001 he started writing seriously and he's found his calling according to the five-star reviews of his books at Amazon. The Be a Book Hero campaign gives Wilson a chance to support something that supported him, the good old school library. Visit his blog at www.beabookhero.blogspot.com to learn how you can help. It's that time of year again when Internetters around the world nominate their favourite children's books for the Cybils. Kid-lit bloggers then read the nominated titles, whittle the long-lists to short-lists and, finally, panels of judges select winners in various categories. The Cybils website is a great source of lists of children's books - some of which originate with small, outside-the-mainstream publishers. Monitor the nominations in your favourite categories and you are sure to discover some nifty treasures!